Could RankBrain be Google’s Ask Jeeves killer? Could RankBrain be the algorithm that ruins Ask Jeeves? This enigmatic billboard photographed in San Francisco by John Trainor in 2007 could be poignant today. (Creative Commons License – Some Rights Reserved). Over the last four months, Google have been quietly working on a new artificial intelligence based algorithm. Known as RankBrain, it aims to settle pub arguments and revolutionise semantic search. As well as being able to search for ‘Dorking’, you can also ask Google, ‘How far from Dorking to London’. Being able to ask a search engine given questions is nothing new. Since its formation in 1996, Ask Jeeves cornered that market. 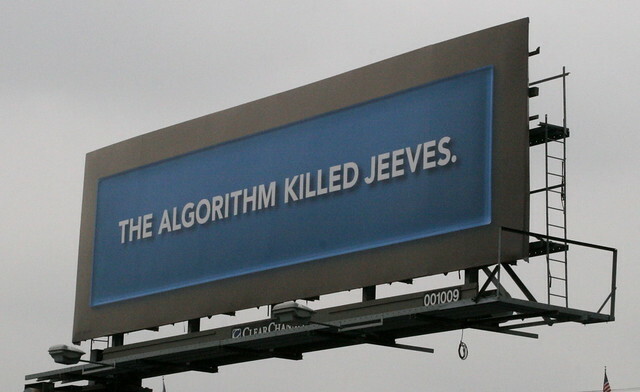 Almost 20 years on, Google’s RankBrain could outdo – and ultimately – kill off Jeeves. RankBrain uses a combination of Machine Learning (where a computer teaches itself how to learn something) and Artificial Intelligence (where a computer is as smart as a human being). In a similar vein is Wolfram Alpha. RankBrain is part of Google’s Hummingbird algorithm, the latter being its main search algorithm. It coexists with the spam-fighting algorithms of Penguin, Panda and Payday; the local SEO-orientated Pigeon; and Top Heavy, designed to demote ad-heavy pages. Google’s Mobile Friendly and Pirate algorithms also coexist. How far from Woodbridge Suffolk to London? Who is The Great Soprendo? 1. How far from Woodbridge Suffolk to London? RankBrain: Google’s answer was 92.8 miles with a journey time of 2 hours 5 minutes (about 46 mph) along the A12. This is illustrated by a map, with journey times available for rail and foot. Ask Jeeves: no answers from Ask Jeeves, only links to hotel sites (sponsored links). Wolfram Alpha: the distance from London to Woodbridge is down as being 74 miles. Which, is as the crow flies from the centre of London. The driving time, 1 hour 25 minutes; Google’s calculation is based on roadworks inside the M25. Best Answer: Google’s RankBrain aced it. Their answer was backed up with the usual Google Map which added value to the search query. Also the journey times by foot and train (the London station you need is Liverpool Street by the way, and your author knew already). 2. What is a Parsec? Wolfram Alpha: “noun | a unit of astronomical length based on the distance from Earth at which stellar parallax is 1 second of arc; equivalent to 3.262 light years”. Best Answer: Evenly matched across all three search engines but the most informative answer came from Wolfram Alpha. Not only the standard answer but also a list of anagrams, how parsec is presented as crossword clues (from the New York Times) and Scrabble scores. 3. Where is York Minster? RankBrain: Google RankBrain gives you the exact answer straight away: “Deangate, York YO1 7HH, United Kingdom”. Ask Jeeves: No straight answers: sponsored links to hotel site are seen ‘above the fold’. The closest is a top right link leading to an answers.com domain (Jeeves, you’re letting us down here…). Wolfram Alpha: No answer. The user is presented with a disambiguation page allowing them to choose from York in the U.S.A or the one in North Yorkshire. There is details on York though not the Minster. Best Answer: Google RankBrain; the most direct and accurate answer. Plus on Google Maps, it tells you about the iconic building being ten minutes walk (or 12 – 15 minutes from one of the station’s more westerly platforms). 4. Who is The Great Soprendo? RankBrain: the answer, Geoffrey Durham, also includes his birthdate as part of a Wikipedia entry and a separate entry on the right hand side of the browser window. Ask Jeeves: excerpt of Wikipedia entry on Geoffrey Durham and a little description (top right) from the KGB Answers page. Wolfram Alpha: a case of “Who’s The Great Soprendo?”, the search engine didn’t understand who he was (we know it’s the magician Geoffrey Durham, and the former spouse of comedian Victoria Wood). Best Answer: A tie between Ask Jeeves and Google’s RankBrain. Is Google RankBrain the Ask Jeeves killer? Going off the quality of answers in our sample, Ask Jeeves should be watching events at Mountain View with great interest. Google’s RankBrain was the most consistent performer giving us all the answers we wanted. With Ask (Ask Jeeves in the UK) having such a small market share, the butler could be retired for good if RankBrain outdoes IAC’s search engine. Wolfram Alpha on the other hand, is less likely to be affected by RankBrain’s introduction. It is very much a niche search engine and has premium priced packages for professional users. There is a more academic bias which uses external data via curation. Ask Jeeves was great in the early days of the internet – back in the day when AOL discs made better cup coasters than bloatware for dial-up internet access. Today, Google’s new additional algorithm is set to ruffle the feathers of IAC. Given Google’s determination, another possible success. One likely to succeed owing to our shift in browsing habits from desktop to tablet and smartphone.